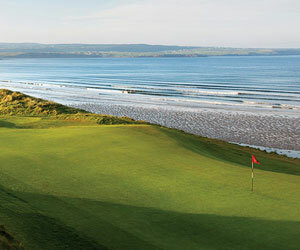 The Westin Turnberry Resort is already gearing up to host the 2009 British Open on the world famous Ailsa golf course. It gets its name from the ominous Ailsa Craig, a volcanic rock set a mile or so out in the nearby sea that can be seen on a clear day. A local saying says "if you can see the Ailsa rock, it's about to rain. If you can't it's raining." On this particular day, Ailsa Craig could be seen faintly, but no rain came along. The Ailsa was originally built in 1902 but was closed during World War 1 and 2 when the land was plowed over and turned into an airport for the military. Runways replaced fairways and the course didn't reopen until 1951, when Mackenzie Ross restored the course to its former glory, and the Ailsa was once again among the world's elite. The Ailsa course is most famously known for the Open Championship's 1977 "Duel in the Sun", where Tom Watson and Jack Nicklaus had an epic duel coming down to the 72nd hole on the sun-scorched links, where Watson prevailed matching Nicklaus' birdie. Turnberry's Ailsa course is set to host the 2009 British Open. The first green on the Ailsa. The lighthouse is visable from most points on the course. The lighthouse in the distance and saltwater smell makes the 10th one of the more memorable holes at Turnberry. The 16th, called "Wee Burn". The intimidating view from the 18th tee. The hotel and pitch 'n putt course in the front yard. The 18 hole putting course.